PRECISE, VERSATILE. EXPERT BLENDING FOR ALL FORMULAS. A 3-sided makeup blender sponge for foundation designed without latex—perfect for applying and blending all formulas. Use the slanted edge of the makeup sponge for controlled stippling, the mini-moon edge for targeted coverage (perfect for the under eyes), and the rounded end for all-over buffing. No matter the formula—liquid, cream, or powder—the Precision Makeup Sponge 100 lets you customize your coverage, born to deliver fast, easy, seamless results every time. 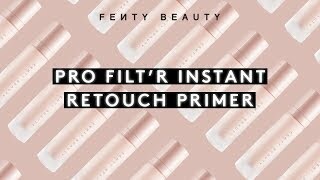 Rihanna wanted to ensure the texture and bounce of the makeup sponge was just right, and that the angles were perfect for both buffing all over and getting into those difficult corners of the face. Use Precision Makeup Sponge 100 damp for buildable coverage; use dry for full coverage. PRECISION MAKEUP SPONGE is rated 4.5 out of 5 by 37. Rated 4 out of 5 by Sarah1997 from Really soft It really soft and blends you makeup beautifully. But, it soaks up a lot of product. Like more than a true beauty blender. Other than that it gives you a beautiful finish and it’s great for baking! So I do recommend this sponge. Rated 3 out of 5 by Alirose from Weird indentations on it I got my first one yesterday after hearing great things about it, but when I took it out of the packaging I noticed weird indents on it.. wish that for the price I paid it looked how it was supposed to. Rated 5 out of 5 by Chanelgirl19 from Super Soft Super soft sponge that is easy to use and multi purposeful. I use the rounded side for more full coverage, the flat top edge for under eye, and flat side for sheer coverage application. Def recommend but do not think this is your average beauty blender! Rated 5 out of 5 by Nichelle from Soft and effective This sponge is effective wet or dry. Not scratchy and doesn’t get hard when it dries. It produces excellent coverage whether you dab or smear. It is just like all of the Fenty product I’ve purchased, like butter babae! Rated 5 out of 5 by Groove from Best Makeup Sponge Ever! I am in love with this makeup sponge! It changed my life lol! It blends the foundation on your face very smoothly! Better than any makeup brush I’ve had! Satisfied Customer! Rated 5 out of 5 by Shelly B. from Best Sponge Applicator! This is, by far, the best sponge applicator/blender that I have ever used and I am 52 years old - I’ve used many!